Carbon monoxide alarms are increasingly viewed as an important safety devices within the home. So what is carbon monoxide? Carbon monoxide is an odourless poisonous gas. It is formed naturally as the exhaust from burned fuel like coal or gas. It is normally goes harmlessly outside through a flue. Your gas boiler is usually mounted on an outside wall with the flue going through the wall to the outside. Why do you need an alarm? If your boiler develops a fault or has not been properly installed there is a chance carbon monoxide can enter your home. If it builds up to certain levels it can potentially kill you. 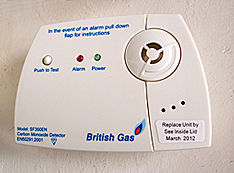 The alarm will sound as soon as it detects carbon monoxide. They used to be quite expensive but the prices have come right down as demand has increased and they have become widely available. You should be able to get one for £20-£30. Fitting is easy. Simply screw them to the wall as you would a smoke alarm. They should be placed in the room you have a boiler or gas fire etc. Follow the fitting instructions supplied. Normally they are positioned at least above door height on the wall.